Good afternoon, Geek Nation, and welcome back to the TV Week That Was. Last week was a huge week, but this week was a little less. Filled with holiday offerings and breaks for Thanksgiving, the TV was a bit less. However, there were still several great things happening. Let’s start with Hulu dropping the first three episodes of Marvel’s Runaways, the new adaptation of the classic Marvel comic by Brian K. Vaughn. The series has given us some of the best adaptations of characters we have seen yet. The Runaways are a group a kids who discover that their parents are members of a super villain organization and they take off on the run. We have yet to get the runaway part of Runaways yet, but I am enjoying the movement toward that. We got to see Old Lace, the dinosaur partner of Gert. There has been some changes to Molly from the comics, but they seem to work very well in the live action and as long as the changes to a particular character still encompasses the character’s basic vibe, then I am fine with it. Nico is great. All of the young stars have shown some impressive work so far and I am fully interested. Hulu is not dropping the whole series at once in this case. They will be releasing it weekly on Tuesdays. I would have binged this fully had they dropped the whole season, but now… I must wait. Speaking of interested, ABC released the first 17-minutes from next Friday’s season debut of Agents of SHIELD, which will be two hours in length, and the debut is beyond epic. 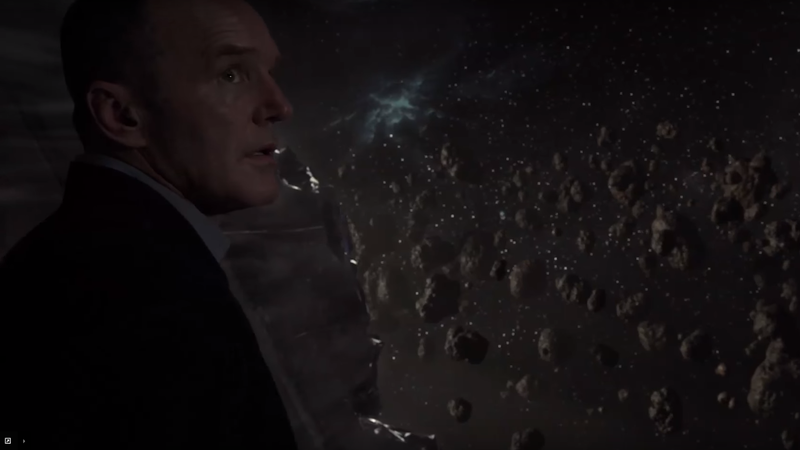 Agent Coulson is back and seems to be in outer space. Mac steals the entire segment with his quips and lines. He was a complete riot in the short preview. In the preview, I literally screamed out twice in shock and laughed I do not know how many times. I have missed Agents of SHIELD and I am very sorry that there are so many people who do not watch this awesome show. Seriously, the first half of season one was pretty weak, but as soon as they got through the Captain America: Winter Soldier, this show has been on fire ever since. Last season with the shortened arcs that included Ghost Rider and the A.I.’s were amazing and this season’s space start was compelling, intriguing and downright scary. All played with the typical wit and humor of Agents of SHIELD. I believe this may be the show’s final season and if that is the case, you need to give this fun ride a chance. Two hour premiere this coming Friday! Be there! This is a HUGE step up from the Inhumans. There was no Gotham this week, but I had missed the episode from the week before and…holy crap!!! Professor Pyg returned and brought the chaos with him. It was one of the best, downright disturbing moments of television this year. Professor Pyg had taken over a party full of the high society of Gotham and forced them to eat some meat pies a la Sweeney Todd. In other words, the pies are people. I am not sure if that was the most disturbing aspect or if it was how the Penguin, trying to protect the boy Pyg held at knife point, grabbed a handful of the people pie and chomped it down. Seriously creepy. Jim Gordon got there soon after and was able to bring and end to the reign of Pyg, but not before some of the wealthiest of Gotham got their comeuppance. “I’ve solved it!” Dirk Gently yelled at the end of the latest episode of Dirk Gently’s Holistic Detective Agency. It was especially sweet because Dirk had been in such a depressed mood recently. It was truly a welcome sight to see him break free from the doldrums. However, it may be too late since the warring factions of the fairy tale world Wendimoor attacked one another leading to major casualties on both sides. Series creator Max Landis tweeted that he was really excited because the next episode (next week) is his favorite of the entire series run. Dirk Gently is consistently one of the most fun shows on television. The Walking Dead’s latest episode was pretty average considering how great the week before was. We got some information and progression on the Negan front, finally going inside the building where he was trapped with Father Gabriel. Meanwhile, we returned to the Saviors who were having some extensional crises with who might be in charge without Negan. That wasn’t working very well and was going to lead to some issues. We also saw an apparent rift between Rick and Daryl as the two best buddies came to blows over a plan. I found that to be pretty dull since we all know that there is no way any sort of rift will continue between Daryl and Rick. In the end, The Walking Dead did not sustain the momentum from last week’s excellent show. Survivor Series was last week with a great match between Brock Lesnar and A.J. Styles on the card. This might have been the best match Brock Lesnar has been involved with since CM Punk. There was also an excellent match between the reuniting Shield and the New Day that kicked off the show. The final match with Team RAW and Team Smackdown seemed a bit of a bungled mess as the people they should be making look great were not the ones there at the end. However, Braun Strowman continues to be the best booked character in the WWE. Can’t wait for Agents of SHIELD this week. By the way…exactly, who is this guy from that 17-minute clip? Friday can’t get here soon enough! Happy Viewing. ← Roman J. Israel, Esq.